There are some singers whose voices are instantly recognisable. Artists like Cher, Freddie Mercury and Rihanna, who you can pick the second they start singing. This week in 1993, a reggae performer debuted on the ARIA chart with the first of several massive hits he'd enjoy over the next decade - and on each of them, his voice was unmistakable. A female singer whose voice is pretty recognisable moved up to the top of the singles chart this week in 1993. 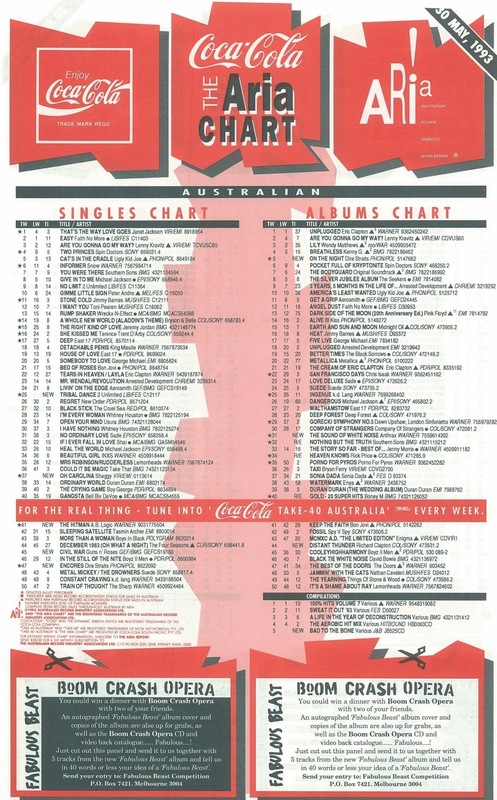 "That's The Way Love Goes" gave Janet Jackson her first - and only - number 1 in Australia. There was a song on Bobby that was a guaranteed attention-grabber, but before releasing that, Bobby Brown chose another piece of generic-sounding, run-of-the-mill new jack swing... and paid the price. One-man band Karl Wallinger had managed one top 100 entry from previous album Goodbye Jumbo, and did the same again with Bang!, although this time World Party had expanded to three regular members. Australia backtracked to pick up this nice but dull single which had preceded "Little Bird" elsewhere, and gave local fans the option of one CD single or a box set of the three that'd been released in the UK. Only her third single to miss the ARIA top 50 (and second to peak at number 51), Madonna's version of the Little Willie John song probably suffered from some versions of the track having been included as bonus tracks on previous release "Bad Girl". Almost a decade earlier, they'd reached number 46 with the live version of "Love Over Gold", and in 1993, Dire Straits fell one place short of matching that with this EP to promote their latest concert album, On The Night. The lead track of Encores was "Your Latest Trick", which had been the final single lifted from Brothers In Arms in 1986, but missed the top 100 locally. This would be the band's last appearance on the singles chart - hardly surprising since they split in 1995 following the release of yet another live album. Who did they think they were: Michael Jackson? The series of singles taken from Guns n' Roses' Use Your Illusion albums continued with a seventh track lifted from the double album. "Civil War" actually dated back to 1990, when it first appeared on charity album Nobody's Child: Romanian Angel Appeal, and didn't follow the other six singles from Use Your Illusion I and II into the top 20. 2 Unlimited had helped set the standard for the he raps/she sings style of Eurodance that would proliferate during the 1990s, and the imitators came thick and fast, including this one-hit wonder duo from Belgium. Released in August 1992, "The Hitman" took its time to cross over in Australia, but ended up as one of the biggest dance hits of 1993. It wasn't quite the last we'd hear from singer Marianne Festraets and rapper K-Swing (aka Cedric Murril), who'd return to the top 100 in the coming months. With Snow vaulting up the chart (and soon to take up residency at number 1), it was clear reggae was making a comeback, and this debut single by the performer born Orville Burrell was part of the wave of reggae hits that would roll out over the next few months. A remake of an old ska song by Folkes Brothers from 1960, "Oh Carolina" introduced the world to the gravelly voiced Shaggy, who took his name from the scaredy cat Scooby-Doo character. Managing to sound both like a relic from the past and, at the same time, quite fresh, Shaggy's update kept the basic feel of the original and lent it some '90s oomph. I can't say I have ever enjoyed "Oh Carolina", or any of Shaggy's subsequent hits (that he thankfully spread out at regular intervals over the next 10 years with big gaps in between), but clearly a lot of people did, with the song making the Australian top 5 and topping the UK chart. And here are the Eurodance trendsetters themselves with the follow-up to "No Limit". The jungle-themed "Tribal Dance" gave Anita and Ray their second consecutive top 10 hit, although what we didn't know at the time was that it would be the last 2 Unlimited song to perform so well, despite a string of excellent singles (and a few duds) still to come. For now, though, the duo were at the top of their game, earning gold records for this and "No Limit", and a top 3 peak for their second album, No Limits, in June. Next week: the metal song that would become an unlikely UK Christmas number 1 more than a decade-and-a-half later, plus the latest US male vocal harmony group lick their way up and down the ARIA chart. I'm not sure I've heard the Bobby Brown or World Party tracks before. I like 'Cold', but it's a bit dull other than the middle 8. But as someone comments on the YouTube upload, ""Dying is easy, it's living that scares me to death" .... those words have stuck with me for years.﻿"
I thought the short red hair in the 'Fever' video suit Madonna, even if it's (I assume?) a wig. Her singles didn't normally flop here, so it was always interesting when one did. It's bizarre that the earlier studio version of 'Your Latest Trick' missed the top 100, given it was a radio staple at the time, and I knew it (though never knew what it was called until the release of 'Encores'). 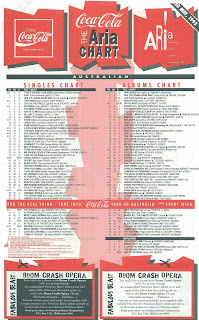 I heard 'Civil War' in 1990 when it entered the Triple M top 8 at 8 and spent a while on it. Like 'Knockin' On Heaven's Door', its belated single release was odd. I still love 'The Hitman', though it was very 2 Unlimited-sounding. 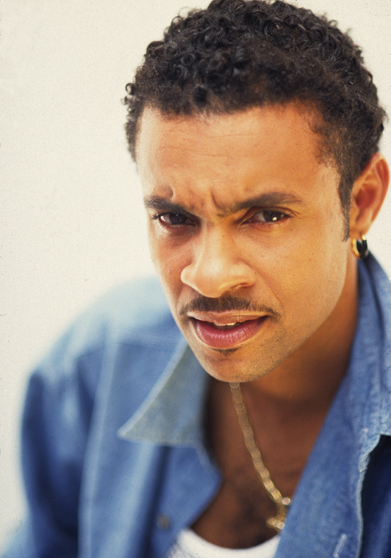 I've never cared much for 'Oh Carolina', but Shaggy's voice was... distinctive, as you say. 'Tribal Dance' is OK, but not among my favourite 2 Unlimited tracks. Pity it was their last big hit locally. It's strange how "Tribal Dance" outcharted "No Limit". I thought "No Limit" was the vastly superior song. "Oh Carolina" is the only Shaggy song I can stand; the others I find incredibly irritating. Take out his voice and the music behind it ain't bad. "The Hitman" still sounds good, I think! Great tune. David, there will still be one more Use Your Illusion single left to be released later in 1993, 'Estranged' even charted higher than 'Civil War', incredible considering it was the 8th single from the set - but I'd suggest the OTT music video helped it's chart position quite a lot. Ah, I didn't look far enough their discography! Will amend copy... Oh, and it's Gavin. lol sorry Gavin, must have had David on my mind! The Australian release of Madonna's "Fever" was a wasted opportunity. There were countless otherwise promo only/unreleased mixes they could have included on a cd maxi here to give fans an incentive to buy and may have resulted in a top 40/50 placement. The video version especially, which was only released commercially in Germany, would have been a welcome addition.